a tisane made with lemon verbena. Preheat the oven to 100°C/Gas ¼. Scatter the pistachios on a baking tray and roast in the low oven for about 20 minutes – to just tickle out and intensify their flavour rather than colour them. Roasting also firms up their texture to give the nougat a little crunch. Using a sharp knife, cut the chocolate into roughly 1cm pieces and place in the freezer to chill thoroughly. Cut the butter into 1cm chunks and place in the fridge for 20 minutes. Cut the candied peel into 1–2cm pieces. Strip the leaves from the rosemary and finely chop them. Remove the seeds from the vanilla pod and set them aside along with the rosemary. a little butter first, to help the rice paper stick to the tray. Put the caster sugar, honey and glucose into a heavy-based pan and add the water. Place the pan over a medium heat to dissolve the sugar and bring to the boil. Once the sugar begins to boil, little crystals may form on the sides of the pan; if so remove these by brushing with a pastry brush dipped in water. Continue to boil until the syrup reaches 135°C; you will need a sugar thermometer to check this. While the syrup mixture is heating, using a mixer fitted with the whisk attachment, slowly whisk the egg whites with a pinch of salt until the eggs break down. Then increase the speed and whisk until soft peaks form. As soon as the sugar syrup reaches the correct temperature, remove from the heat and let it rest for a minute or so. Then, with the mixer on a low speed, slowly pour the sugar syrup onto the whites as they are whisking. Once it is all added, increase the speed; this will cool the mixture slightly. When the mixture is still just warm, add the butter pieces, still whisking to break down and incorporate the butter as it moves through the meringue. Once it is evenly combined, add the vanilla and rosemary. Remove the bowl from the machine and fold in the pistachios and candied peel. Lastly stir in the white chocolate pieces. It is important to work quite quickly at this stage as the mixture will begin to set. Pour the mixture into the prepared tin. Press the two remaining sheets of rice paper firmly on top, ensuring any air bubbles are removed. Cover with cling film and chill in the fridge for at least 4 hours, preferably overnight. 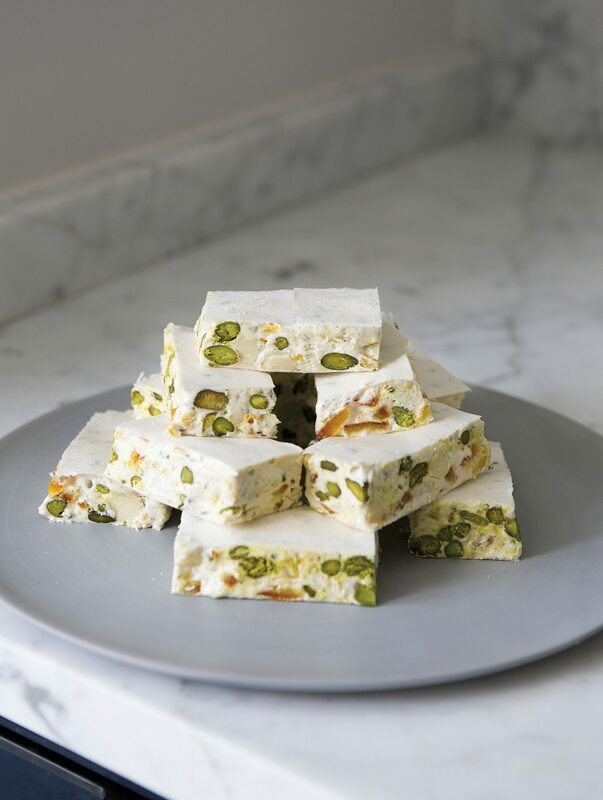 Using a sharp serrated knife, trim the edges of the nougat to neaten, then cut into small slices. Return to the fridge until ready to serve.